Santiago has her work cut out for her. She is running against incumbent Ray Suarez, a man who since 1991 has represented the 31st ward. “He is part of the political machine. The Joe Berrios machine. Enough is enough,” said Santiago. “For far too long the residents of the 31st ward have been bullied by an alderman that consistently puts his interest before those of the community.” According to Santiago and several proprietors, Suarez has allegedly forced business owners to contribute to his political fund. “We need to step up as a community and now allow for an injustice like this to happen.” Santiago has vowed to better the community by proposing several changes. We know gang infestation is a problem. In light of recent events people have lost their faith and trust in police officers. I vow to change that by asking the community to attend CAPS meeting and really work with Chicago police officers so together we can address the issue of gangs. The last thing a working family needs is someone recruiting their child to join a gang. We need to have better communication with police officers so we can better look after our community. It is bitter sweet to see so many thriving communities due to private sector business. I would like to see more of that in the 31st ward, for instance we need a chamber of commerce. We hardly have an umbrella network that all businesses can be a part of so we need to change that. We deserve to have a thriving community, too. We need more resources for CPS. We also need to bring a trade school and magnet school to the 31st ward. Trade schools back in the day were popular and helped create jobs for families. Whatever I can do to bring more resources and more income to the 31st ward, I will do. With endorsements from 1st ward Alderman Proco Joe Moreno, 8th District Cook County Commissioner Luis Arroyo Jr., and most recently Congressman Luis Gutierrez, Santiago hopes her message is heard by all from the 31st ward. “I am here to serve my community and I will not become complacent nor will I abuse my position of elected alderman. 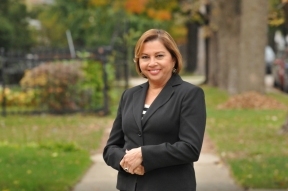 I will always look after the interest of my community.” If elected, Santiago would be the first Latina alderman.